Introducing the titanium heater with Precision Aquarium digital heater controller. JBJ has done it again with the new heater called the True Temp Heating System with digital Controller & Titanium Heating Element 300W T3-300. 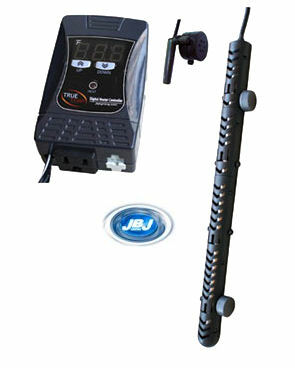 JBJ introduces the TRUE TEMP digital heater controller and titanium heating system. The TRUE TEMP is the most comprehensive heating system to date with the most advanced features that set it apart as the leading heater for professional hobbyists. Our digital microprocessor boasts amazing +/- 0.5 F accuracy, a calibration setting, indestructible titanium heating element with thermal shut off, smart memory chip, LED heating indicator, magnetic heater/probe holders, safety guard, remote temperature probe, and a large constant LED display of the current temperature. Maintaining the correct temperature for tropical fish may be the single most important factor for a successful aquarium. Since fish do not have the ability to regulate their own body temperature, it is crucial that we can provide consistent water temperatures with minimal fluctuations. Most fish cannot cope with stress from constant temperature fluctuations, which leads to a compromised immune system. This increases the probability of avoidable diseases, parasites, and bacterial infections. Keep your fish happy with this high quality aquarium heater. Don’t be fooled, some controllers still incorporate analog dials and knobs without the precision accuracy of TRUE digital controllers. Our advanced microprocessor constantly reads and displays the correct temperature to a tenth of a degree with a large LED display. Easy push buttons make setting your desired temperature simple and easy. The perfect submersible element for fresh or saltwater aquaria. Virtually indestructible with the benefits of fast heat transfer without any corrosion. Integrated thermal shut off and out of water safety mechanism. Most heaters have an integrated temperature probe within the same heating element. This can lead to false readings and premature ON/OFF cycles. The TRUE TEMP digital controller is equipped with a remote quick disconnect temperature probe that can be placed up to 5 feet away from the heating element for a comprehensive temperature measurement of the total volume of water. Quick disconnect temperature probe grants easy replacement without the need to replace the entire controller in the event it fails. All titanium heating elements are securely placed inside our safety guards that protect you and your livestock from the heating core. Our flow thru design grants continuous water contact without interruption. Include innovative magnetic heater and temperature probe holders that replace outdated and unreliable rubber suction cups that constantly lose their hold. Easily place your heater vertically, horizontally, or at any angle you please with long lasting stability. Have you ever noticed that majority of heaters cannot be calibrated. Often times, errors do occur during the calibration process. The ability to cross reference ensures your temperature is accurate and always correct. An integrated smart memory chip will restore the previous temperature set point and calibration to the last stored setting once the power returns after a failure. This alleviates having to manually reset settings forever. 100% Digital Operation: The advanced microprocessor constantly reads and displays the correct temperature to a tenth of a degree with a large LED display. Easy push buttons make setting your desired temperature simple and easy. Heating Element: Titanium—the perfect submersible element for fresh or saltwater aquaria. Virtually indestructible with the benefits of fast heat transfer without any corrosion. Integrated thermal shut off and out of water safety mechanism. Remote Temperature Probe: Most heaters have an integrated temperature probe within the same heating element. This can lead to false readings and premature ON/OFF cycles. 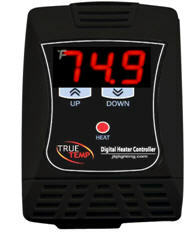 The True Temp digital controller is equipped with a remote quick disconnect temperature probe that can be placed up to 5 feet away from the heating element for a comprehensive temperature measurement of the total volume of water. Quick disconnect temperature probe grants easy replacement without the need to replace the entire controller in the event it fails. Safety Guard: All titanium heating elements are securely placed inside our safety guards that protect you and your livestock from the heating core. The flow thru design grants continuous water contact without interruption. Cross Reference Capability: The majority of heaters cannot be calibrated. Often times, errors do occur during the calibration process. The ability to cross reference ensures your temperature is accurate and always correct. Smart Memory Chip: An integrateted smart memory chip will restore the previous temperature set point and calibration to the last stored setting once the power returns after a failure. This alleviates having to manually reset settings forever. 100% DIGITAL Heater Controller. Don’t be fooled, some controllers still incorporate analog dials and knobs without the precision accuracy of TRUE digital controllers. Our advanced microprocessor constantly reads and displays the correct temperature with a LARGE LED Display. Easy push buttons make setting your desired temperature simple and easy. Tired of the same old aquarium heater that does not keep precision control? Try the new JBJ TRUE TEMP 150 Watt Aquarium heater and controller. Not your old fashioned fish tank heater that you are used to. For those who demand the best they get the JBJ titanium heater plus Super Aquarium digital heater controller.